A soldier is never off duty. This was proved by Lieutenant Rahul Dalal, a navigating officer in INS Sutlej, who saved a drowning man at Kerala's Vypin beach. If not for Lt Rahul, the man, identified as Dileep Kumar from Aurangabad, would not had been saved, onlookers claimed. The incident was shared by the Indian Navy on social media, drawing wide praises from netizens. 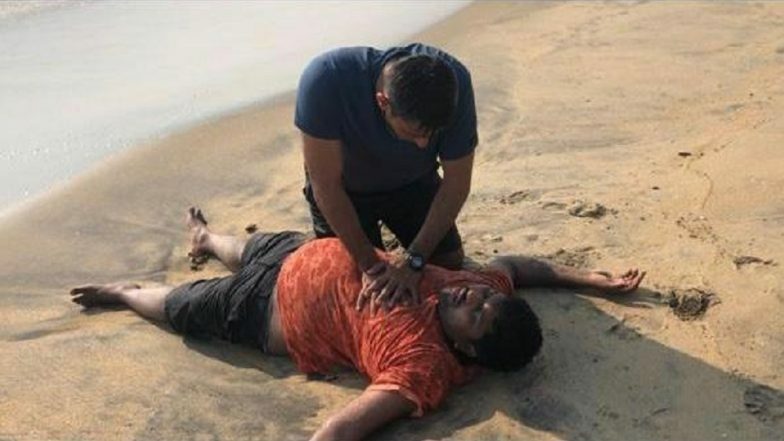 After bringing him to the shore, Lt Rahul revived Kumar through Cardiopulmonary Resuscitation (CPR), and subsequently rushed him to the nearest government hospital. Thanks for sharing this. Such public appreciation is really required. It will encourage young people to join armed forces. Receiving gallantry medal is generally remains confined however such appreciation spread in masses. Dileep Kumar's condition is now reported to be stable. He was discharged from the hospital after completely recuperating. Although Kumar was lucky enough, not everyone could meet the same fate. It is recommended for beach-goers to ensure they are way away from the tides, especially when a lifeguard is not around.